From record rains in Ann Arbor to a federal study on the health of our nation’s streams and rivers, this edition of News to Us highlights a variety of news items that focus on impacts on water quality and what people are doing to help. Ann Arbor’s 4th wettest year on record results in higher Huron River levels – So far, 2013 has given Ann Arbor quite a lot of rain. The June 27 storm alone had a tremendous impact on our river. HRWC’s executive director Laura Rubin explains that storms like that will soon be the norm as a result of climate change. Learn more about climate change in the watershed. 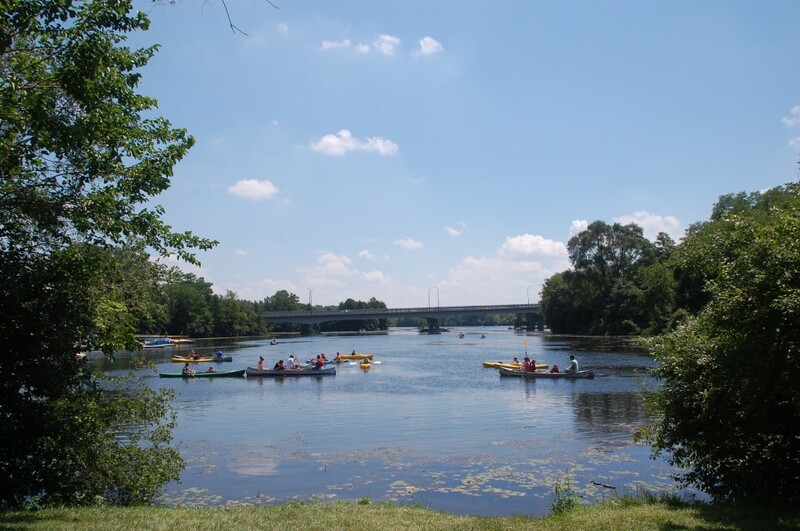 Huron River health: Phosphorus levels have dropped 25 percent in the past 15 years – Thanks to HRWC and all of it’s volunteers, the Huron River is one of the cleanest in the state. One noteworthy victory is the reduction of phosphorus levels in the river. HRWC’s Laura Rubin and Ric Lawson explain why this is such good news, and what we have to work on next. The High Cost of Free Curb and Gutter – Do stormwater and parking have anything in common? Yes! This article proposes new ways of dealing with runoff and looks at modern parking practices to create better stormwater runoff management. Learn more about urban stormwater runoff and green infrastructure. Can Beer Force Obama to Clean Up the Water Act? – Our local brewers are standing up for something pretty important – protecting water quality! Surprisingly, beer is 90% water. Michigan brewers largely rely on water from the Great Lakes. If that water isn’t high quality, then their beer won’t be high quality. HRWC’s September 12th event Suds on the River exemplifies this idea by allowing you to enjoy beer made out of water from the Huron. Scientists Diagnose Streams in Trouble – Federal scientists recently completed a study regarding the health of our nation’s streams and rivers. Using a more holistic approach, they looked at how people were affecting the health of algae, fish and macroinvertebrates in the water. Study results show that at least one of these groups were negatively impacted in 83% of the streams in urban and agricultural areas and that the healthier streams received less runoff from urban areas. Learn more about urban runoff and protecting local water quality. Wait…Something Just Touched You? – Invasive lake weeds can take over, making swimming unpleasant and crowding out native plants. The Eurasian watermilfoil is an invasive species that has little to no predators at the moment and grows so densely that it gets tangled on boat motors and even people, and greatly harms fish habitat. Cutting it down, can actually spread it even further. The Michigan Clean Water Corps is helping Michigan residents, boaters and lake-shore homeowners learn what to do.